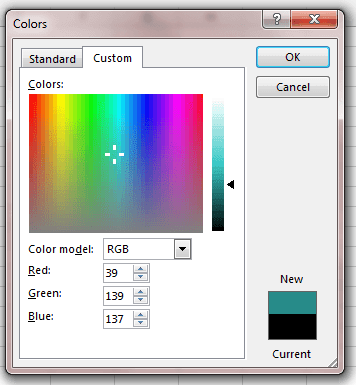 Hello, here I am present to give you a complete guide on how you can work with Excel font color and background color of cells. I will show you a handsome number of ways you can use to change the color of text and the background of cells. You can take it as a complete guide on Excel Font and Fill color. If you know more ways(except the ones discussed here) to work with Excel Font and Background color of cells, then please put your valuable opinion in the comment section, I shall add your point in my next update of this post. Some days ago, I was working with an Excel template, the template was using some “Green” text as default. It is easy to change the color of some text in an Excel workbook, you know how to do it. 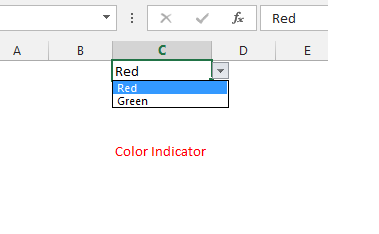 But it is possible that you don’t know how to use some color as default in an Excel workbook. This is a guide that will help you to master all the techniques you have to know to work with the Font color and Fill color change in an Excel workbook. There are a number of ways you can work with to change the color of text and the background of cells in Excel. You might want to change the color of some text. It is the simplest way. Just select the text or cells where you want to apply a different color, then in the Home ribbon’s Font group choose the Font Color. Font Color command is a split button. If you click on the left part of the button, the existing color (in the below image existing color is Red) will be selected and will be applied to your text, if you click on the right part of the button, then a color palette will open a menu. The first color in the palette is Automatic, it’s the default Black color. Then the Theme Colors, then the 10 Standard Colors. 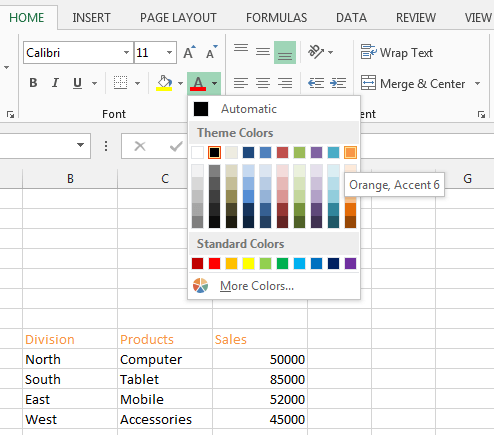 The Theme Colors and Standard Colors are built-in color codes, Excel has built these codes for you to use directly. You can also use your very own colors. How to do that? In the next section, you’ll get your answer. Choose a color for your text. In the image, you see, I have selected Orange, Accent 6 color for my text Division, Products, and Sales. We’re done. We have made a different color for some of our text. You can work with custom colors, your very own colors. To do that, at the end of the color palette, you’ll find More Colors… option. If you click on the More Colors… option, Colors dialog box will appear.Colors dialog box has two tabs. First one is a Standard tab and another one is Custom. In the Standard tab, you’ll find again the built in color codes. To work with your own colors, you have to click on the Custom tab. In the Custom tab, you’ll find that you can work with two types of Color model: RGB and HSL. For now, just follow me, I use 39 for R(R for Red), 137 for G(G for Green) and 139 for B(B for Blue). These three numbers together generate a nice color like the image below. 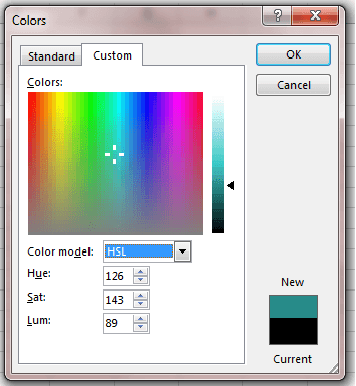 Colors dialog box. Creating Custom Colors. On the bottom-right corner of the dialog box, you will get the recently created color(New) and the Current color. You can compare the colors using this little window. If you change the color model from RGB to HSL, you’ll get the equivalent color codes for HSL color model. See the image below. Did you use Format Cells dialog box ever? Format Cells dialog box is the ultimate dialog box to work with the formatting of cells and text. You will get all the options to format a cell or a text in this dialog box. This dialog box has six tabs: Number, Alignment, Font, Border, Fill, and Protection. 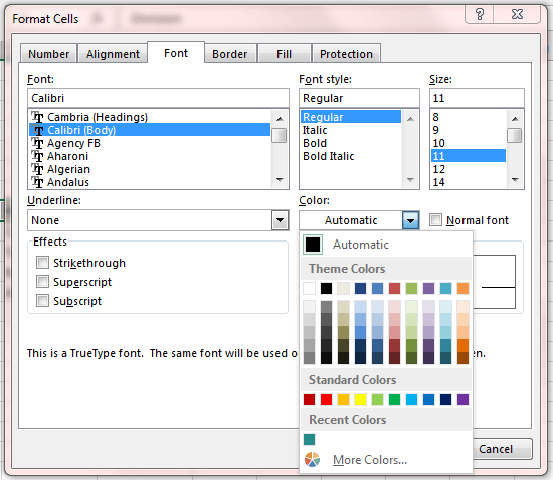 To change color of text, you have to click on the Font tab in this dialog box, in the Font tab, you will find a Color zone, there just click on the Automatic drop down, you will find the same color palette you found when you clicked on the Font Color command in the Home ribbon. You know how to handle this color palette. Rest on you. The below question was dropped in a forum. The solution is also there. Just to teach all the techniques on changing text color, I am putting this technique here in more details. Changing text color of a cell based on other cell value. In the cell B1, type any text, I type in my worksheet “Color Indicator”. In the cell B8, type any value, though typing any value at this stage is not necessary. But I type 10 in the cell B8. Now select cell B1 again and click Conditional Formatting command in the Home ribbon, a menu appears, click on New Rule option in the list. New Formatting Rule dialog box appears. 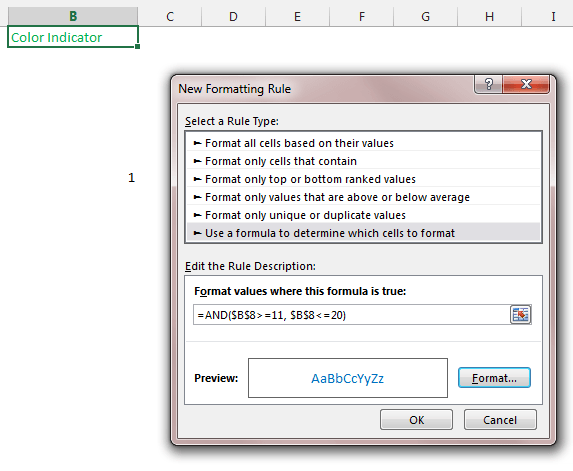 In the New Formatting Rule dialog box, you see there is a window under Select a Rule Type heading. 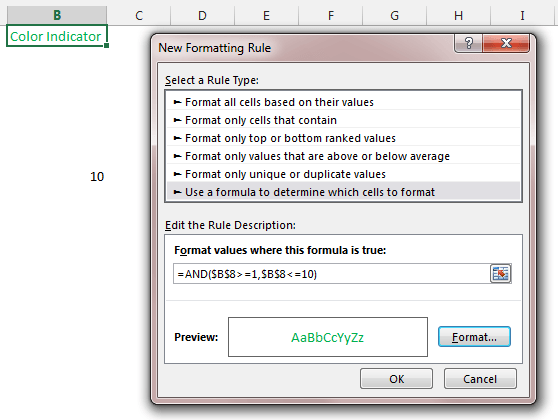 In the window, select the last one rule type: Use a formula to determine which cells to format. Then click on the Format… button on the bottom right corner, Format Cells dialog box appears, choose the standard Green color in the color palette. New Formatting Rule dialog box will look like the below image. New Formatting Rule dialog box looks like this after applying the above steps. 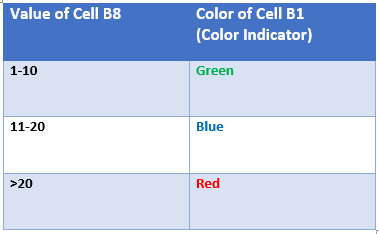 If you now change the value of cell B8 between 1 to 10, the text color of cell B1 will change to Green. But if you enter a value other than between 1 to 10, nothing will happen. The reason is we have set only formatting rule for value between 1 to 10. We have to set the rule for other value too. The other rules are simple. New Formatting Rule Dialog Box when you apply the next rule. To apply a rule for the value greater than 20 is simple: =$B$8>=20. You don’t have to use AND function. As there is only one condition in the formula. Again just follow the above steps from 3 to 5 and in the 6th step, in the field put this formula: =$B$8>=20. In the 7th step, choose the Red color. We’re done. Now input any value in the B8 cell, you will see the change in color in cell B1. I have selected value 125 in the cell B8, you see the color is Red, Color Indicator text is now Red color. Color changes when the value changes. Value 125 is greater than 20, so the text is Red now. Click OK. You see a list is created in cell C1. Look at the image below. From Select a Rule Type window select Use a formula to determine which cells to format option. Then click OK, Format Cells dialog box disappears, again click OK, New Formatting Rule dialog box also disappears. We’re done for the Red color. 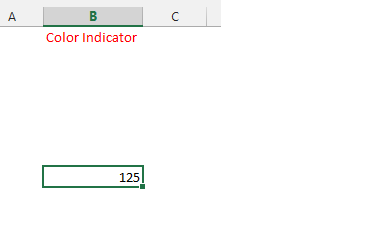 Create formatting formula for Green color in the same way. When you’re done, your image should look like the following one. Homework 1: Here goes a little homework for you. I made the formula for Red color, your job is to find out the formula for Green color. Homework 2: Create a drop down list for colors Red, Green, Yellow, Blue, Orange in a cell. Then change the text color of a cell on the basis of the drop down list colors, the things we have done in our this section.